Here at Eric B. Mast Enterprises, we have 20+ years of industry experience and look forward to the opportunity to put all of those years to work for you. Roof coatings are just one of the many services we have to offer, but it is one of our favorite. We enjoy providing services that save our clients money and give them a well-protected roof. If you are interested in a roof coating for your commercial or industrial property call us today. Our Farmville, Virginia property owners can reach us at (804) 357-8038. To help you learn about roof coatings and their many advantages we put together a list of frequently asked questions, FAQs. We want our customers to be fully educated on the many services we offer to improve their roofing systems. What roofing applications can be coated or restored? Great news! Coatings can be applied to a wide variety of substrates. Single-ply, TPO, EPDM, foam, metal, PVC and built-up to name a few. Call our office to see if your roof can be coated. How do I know that my roof needs to be coated? Are you consistently shelling out money for minor repairs? Have you noticed a few tears or split seams? Or perhaps your commercial roof was just replaced and you are hoping for additional fortification. Roof coatings are great for removing the need for constant repairs and to add years of worry-free life to a new roof. Will a roof coating lower my annual energy costs? They sure do! Instead of absorbing heat from the sun, their reflective properties reflect harmful UV rays. This gives your air conditioning a well-deserved break. Coatings have shown to lower annual energy costs by as much as 30%. Can my restored roof be recoated in the future? It can. If your roof is ready to be re-coated, don’t hesitate to call, we’ll treat your roof so you can continue having a worry-free roof. Even better news, roof coatings systems are state and federal code compliant. 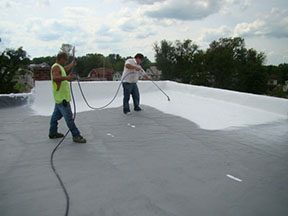 Why should I coat my commercial roof? If having a roof that is seamless, water tight, and environmentally friendly appeals to you, you could benefit from a roof coating. They also provide reduced roof maintenance, energy savings, and additional employee comfort. 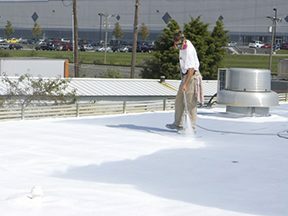 These are just a few reasons why a roof coating is a great option for your facility. Eric B. Mast offers material and labor warranties with all our commercial roofing services. Give us a call for more information – (804) 357-8038. Those of you in Farmville, Virginia or the surrounding communities, call us today for a no-cost, no-obligation roof coating estimate. You can reach us at (804) 357-8038. Together, we can make sure you roof is in the best hands and treated with the best services around. 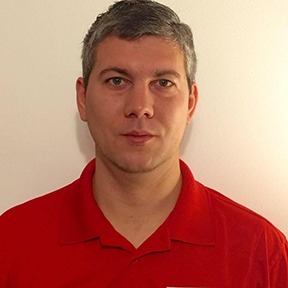 Eric Mast lives in Farmville, Virginia and owns and operates Eric B. Mast Enterprises. Specializing in commercial roof installation, repair, and restoration. Call him for all your commercial roofing needs! Located in Farmville, Virginia, we specialize in Commercial Roof installation, repair, and restoration. We strive for excellent service and complete customer satisfaction on every job we do.